ISC West — Las Vegas, NV (April 11, 2018) – DW® (DW®), the industry leader in digital recorders, surveillance cameras and related management software, is proud to announce the launch of our new real-time 30fps 9MP fisheye MEGApix® Pano™ camera. The DWC-PVF9M2TIR is the latest addition to our growing line of hemispheric fisheye cameras, offering more resolution at 30fps, more pixels when zooming and edge-to-edge clarity. MEGApix® Pano™ 360° view outdoor fisheye IP cameras with IR monitor an entire room with a single camera, providing the ultimate ROI. The 2.1mm fisheye lens provides edge-to-edge image clarity. The 9MP sensor produces real-time 30fps panoramic images in an IP66 vandal resistant discrete housing. The camera is optimized to work with the DW Spectrum® IPVMS dewarping feature. · 360° 55' smart IR™ with intelligent camera sync. Learn more about the new 9MP MEGApix® Pano™ fisheye camera, the complete MEGApix® Pano™ line and all of DW®’s industry-leading video surveillance products at www.digital-watchdog.com. DW® empowers our customers as the industry-leading single source of value-driven complete solutions for all video surveillance applications (HD over Coax® / hybrid / IP enterprise), focusing on ease of use and ROI. 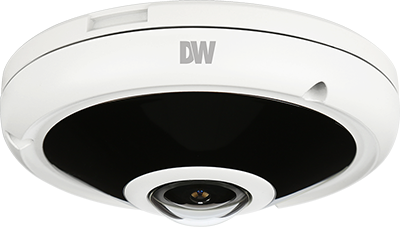 DW® products offer technologically-advanced features including multi-sensor HD cameras at real-time 30fps, Star-Light™ super low light technology, WDR, Smart DNR™ and Smart IR™. Complete IP megapixel surveillance solutions include single- and multi-sensor MEGApix® cameras and edge recording systems, Blackjack® NVRs, Blackjack® NAS devices and DW Spectrum® IPVMS for server, mobile and on-camera control. Complete Universal HD over Coax® surveillance solutions include single- and multi-sensor STAR-LIGHT™ Universal HD over Coax® cameras, VMAX® Universal HD over Coax® DVRs and mobile management applications.